If you've tried it all when it comes to dieting and you're ready to find sustainable, realistic solutions that work, you've come to the right place. Individual nutrition counseling and coaching brings peace with food and a sense of empowerment and confidence in cultivating your ability to make decisions about food. This process is all about connecting with your body rather than fighting against it. Dani's approach to each individual is unique. 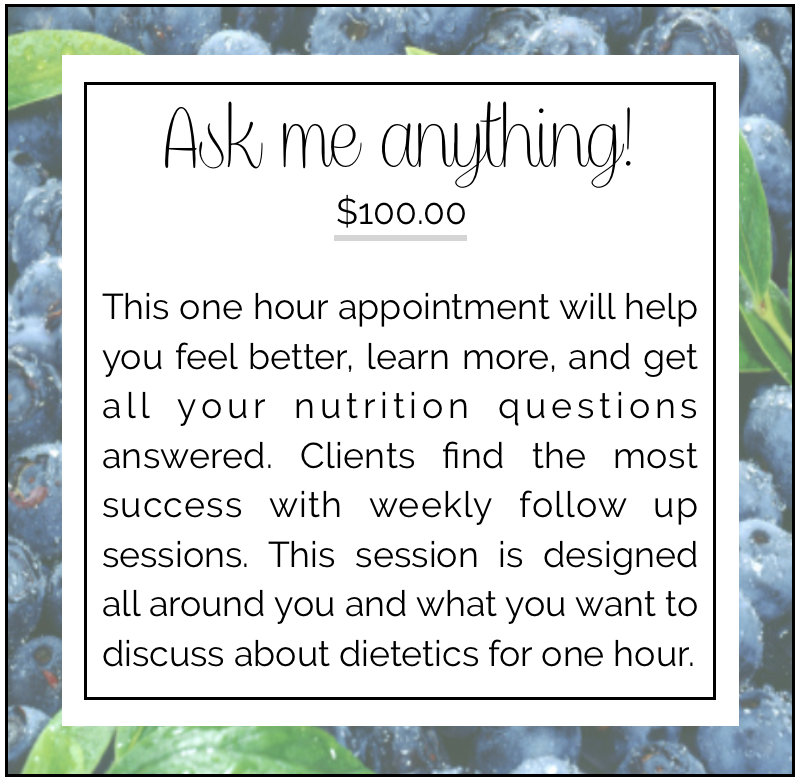 During your first appointment you'll discuss your health history, relationship with food, your dietary goals, what you're overall looking for in terms of quality of life. Some people only need one session to ask questions, but most people participate in multiple sessions. Let's work together to help your employees or clients live happier, healthier lives. Workshops, presentations, or ongoing collaborations available. You will learn how to healthfully reach your goals without any gimmicks or restrictions. You will learn the secret to staying consistent with your new habits and how to become enthusiastic while doing the work. The nutrition sessions are done either in the studio or virtually. A nutritional assessment is an in-depth evaluation of both objective and subjective data related to an individual's food and nutrient intake, lifestyle, and medical history. Once the data on an individual is collected and organized, the practitioner can assess and evaluate the nutritional status of that person. After the consultation, you'll then receive a custom-designed meal plan that will simplify your life and delight your taste buds. It includes 30 days of personalized recipes, with a breakfast, lunch and dinner. All recipes include a recipe analysis and nutritional breakdown. The turn around time for the thirty day personalized meal plan is usually two weeks. Dani offers a range of plans, including Low Carb, Paleo, Ketogenic, Vegan, Vegetarian, Pescatarian, Flexitarian, No Red Meat, Diabetic & Prediabetic, Gluten Free, Dairy Free, Clean Eating, Paleo Cleanse, Low Sodium and more. Many of these plans can be combined.